Following passage of controversial haredi draft law, poll shows most Israeli Jews back drafting nearly all yeshiva students into IDF. Israelis strongly back moves to increase the number of haredi servicemen in the IDF, with a wide majority supporting an end to nearly all draft deferments for yeshiva students, ending four decades of the open-ended deferment program. According to a poll released Monday evening by the Israel Democracy Institute and Tel Aviv University, 70.4% of Israeli Jews say they are in favor of applying the draft to young haredi men, compared to just 25.9% who do not support such a policy. Among Arab Israelis, by comparison, just 26.9% say they would support the draft of haredim, compared to 24.9% who opposed it, with nearly half saying they had no opinion on the matter. Since the establishment of the state in 1948, special dispensation has been given to select groups in Israel with respect to the near universal draft. Most Israeli Arabs are exempt from the draft, as are Druze women and Orthodox Jewish women. In addition, full-time yeshiva students are granted annual draft deferments, allowing them to push off entry into the IDF. While the initial number of deferments was limited, the program expanded significantly during the 1950s and 1960s, before being opened up in the late 1970s, when limitations on the number of deferments was dropped. 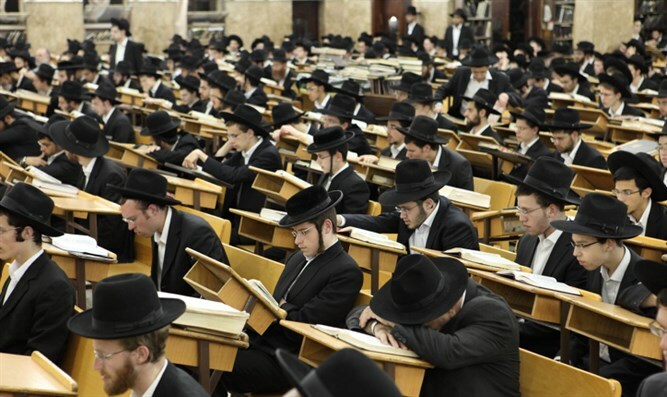 The policy has enabled most haredi men to avoid military service and promoted a massive expansion in the number of Torah students. On Monday night, the Knesset voted 63 to 39 for the first reading of a new draft law that would protect draft deferments while also placing pressure on the haredi community and yeshivas to increase the number of haredi draftees. Yeshivas which fail to meet the government-mandated quotas of new IDF inductees would face financial sanctions, while the entire law itself would be nullified if the haredi community as a whole fails to meet the minimum quotas three years in a row. According to the IDI/TAU poll, few Israeli Jews back the status quo with regards to the open-ended draft deferment program, with a large majority backing a return to the original system, which provided a limited number of deferments to the most promising students. Just 18.4% say they support the status quo, compared to 22.6% who say only a limited number of yeshiva students should be granted exemptions, with nearly all drafted after at the age of 23, rather than the usual draft age of 18. A full 45.4% say no special consideration should be granted to haredi youths, arguing that aside from a limited number of students who excel in Torah studies, all haredi men should be drafted at age 18. Even given the fact that man non-haredim avoid army service for a variety of reasons, including the blanket exemption given to Israeli Arabs, medical exemptions, etc., nearly two-thirds of Israeli Jews say it is important to draft haredi men for the sake of “equalizing the burden” of army service. Just 28.6% said it was not important to draft haredi youths, while 65.9% said it was important or very important.